If professional photography and artisan baking seem to be unrelated, Pat Gleason doesn’t mind. In December 2011, Gleason and his wife, Jeanette, bought a duplex near 44th and Lisbon that needed major repairs. (Jeanette said she almost fell through the floor on their first visit.) 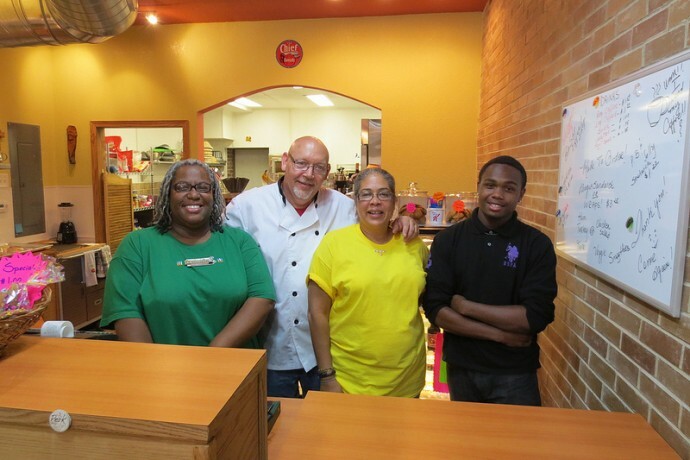 After spending nearly 18 months renovating the building, the two opened Bus Stop Coffee Shop and the Midwest School of Photography there in late May 2013. Since then, they have been baking loaves of bread, muffins, lemon bars, brownies and scones; serving coffee; and working with local artists to develop a course list for the photography school. On a recent summer weekend, they hosted an open house as part of a Bread Bakers Guild of America event. The couple—who live on the second floor of the building, along with their two chihuahuas—have also been reaching out to their new neighbors. 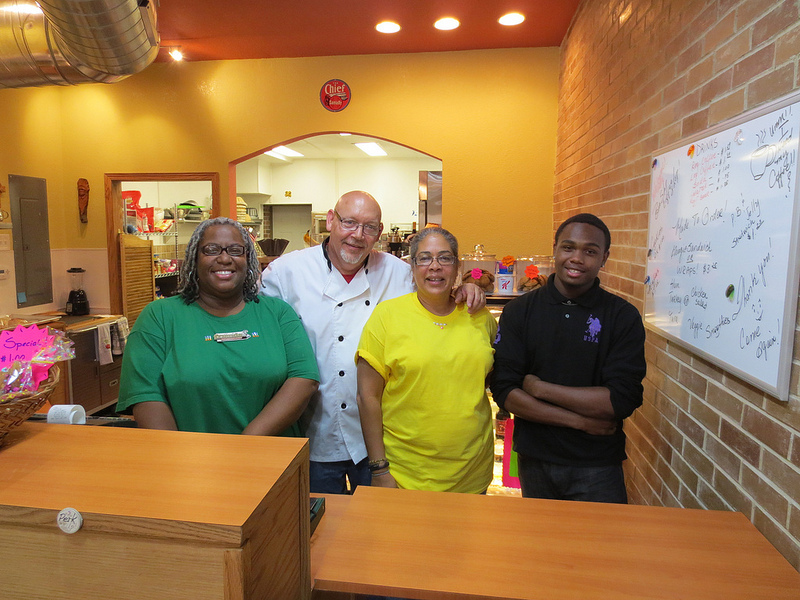 Sherlon Butler, Bus Stop Coffee Shop’s next-door neighbor, is part of that network. 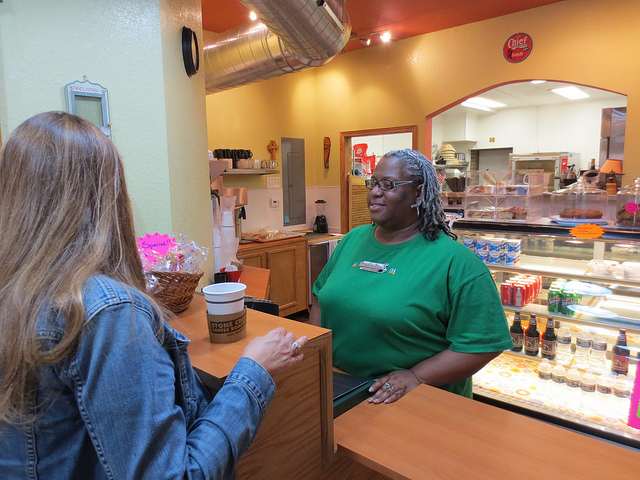 She has lived in the area for 15 years, and said she is doing whatever she can to help out with the new business. This includes volunteering in the bakery. “I love it,” she said. Darvell Lewis, a young community member, is also working with the Gleasons. Lewis graduated from eighth grade at Sherman Multicultural Arts School this spring, and got a job at Bus Stop Coffee Shop the day after he visited it for the first time. He’ll be working as a security guard this summer, and Pat hopes the position will help Lewis save money for a laptop. This fall, Lewis will start high school at Milwaukee High School of the Arts. Though the Gleasons recently moved from Chicago, Pat was familiar with Milwaukee because he lived in Lake Geneva for 12 years and used to visit the city often. They found their building through an online search, looking for a location to open the businesses they had dreamed about. Pat said he has been passionate about baking since 1996, when he served six months in jail after a bar fight in Lake Geneva. During that time, he spent full days in the kitchen and developed a zeal for pastries. He then worked for a period of time as a pastry chef on the Delta Queen Hotel boat, travelling the Mississippi River. Though he spent the majority of his career working as a finance manager in the car business, Pat found time to pursue photographic work on the side. He completed courses at the Rocky Mountain School of Photography in 2004, and plans to draw inspiration for the Midwest School of Photography curriculum from workshops he attended there.